Had you been a wee tot way back in 1939, you probably would have pestered your mother in the kitchen to find out what was on the plate for dinner tonight. No, not “Hot Pockets”, not “Weight Watchers”, not even a Swanson TV Dinner (that didn’t appear until 1953). Nor would she have served you SpaghettiOs (they didn’t arrive on the scene until 1965). No Tater Tots either (1953). Well, in the vintage cookbook “The Day by Day Cook Book”, by Demetria Taylor and Gertrude Lynn, published in 1939, the daily menus are set forth for an entire year, including ‘Breakfast’, ‘Luncheon’ and ‘Dinner’. Today is Tuesday, in the second week of November, so below is a sample of what Mom might have been whipping up in the kitchen, for dinner (without a microwave, convection oven, halogen oven, or a panini press, etc). She might have had an Electrolux Gas Refrigerator if Dad was raking in the big bucks. According to several web sources, the average household income (depending on which statistics you look at) ranged from $1,368 to $1,850 per year. An Electrolux Gas Refrigerator sold for around $145.00 in 1939. That’s a whopping 10% of the average income at the low estimate! How many people today could afford to spend 10% of their annual household income on a refrigerator? Of course, she couldn’t even think of starting dinner until she re-grouped from today’s ‘Luncheon'(for today’s Luncheon, she had to prepare fresh black bean soup from scratch), and whip up some Peanut Butter, Bacon and Lettuce Sandwiches). But just in case she got lax, she had to reserve some energy for Wednesday, second week of November: Homemade Cream of Mushroom Soup, Stuffed Eggs Nantua, Poppy Seed Rolls, Scotch Jumbles, and that was just for Luncheon! Dinner would see her slaving over Hamburger Cakes, Sauteed Raw Potato Slices, Buttered Hubbard Squash, Cucumber and Tomato Salad with homemade French Dressing, and finished with Prune Whip. No wonder mom was always tired! 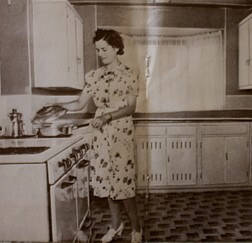 She spent most of her life in the kitchen cooking for the family, without the conveniences we expect today, including prepared foods, instant foods, a huge variety of canned foods from around the globe, and a bevy of kitchen appliances. But, better get back to the kitchen, Mom….you’ve got to start planning today for Thursday! 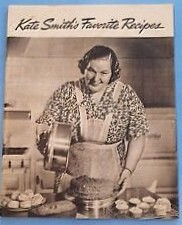 “Kate Smith’s Favorite Recipes”, published in 1939 – Mom may have used some of these recipes, too. This entry was posted in Cookbooks, Cooking, Cooking and Social History, Cooking Technology, Eating, Food Trends, Menu Planning, Uncategorized, Vintage Cookbooks and tagged 1939, 1939 Cooking, Cookbook, cookbooks, Cooking, Demetria Taylor, Electrolux Gas Refrigerator, food history, Gertrude Lynn, Kate Smith, Slim Gaillard, social history, Swanson TV Dinner, time capsules, Vintage Cookbooks. Bookmark the permalink.